Caribbean appetizer recipes? Finding Caribbean recipes is hard enough, but there definitely seems to be a major shortage of sources for Caribbean hors d'oeuvres recipes. Realizing this, we’ve started the hunt for the best Caribbean appetizer recipes we can find. There is definitely no shortage of Dominican appetizers, just sources! When Christopher Columbus found the Caribbean, he commented that this is a gourmet’s paradise. The climate provides an unparalleled supply of exotic fruits and vegetables that are the backbone of Dominican Republic food. While this site focuses on Punta Cana, the resorts tend to offer tastes of the entire Caribbean, so our Caribbean appetizer recipes will bring you flavors from all of these magical islands. While there are many dishes common to all of the islands, most of them have a distinctive cuisine developed in relation to their European controlling power. The Spanish islands of the Dominican Republic, Puerto Rico and Cuba often have more in common with the cuisine of South America than they do with some of their Caribbean neighbours. So don’t be surprised to see some Latin American dishes making their way onto the list of our Caribbean appetizer recipes. Here’s a list of Caribbean ingredients that are prevalent in many Caribbean appetizer recipes. 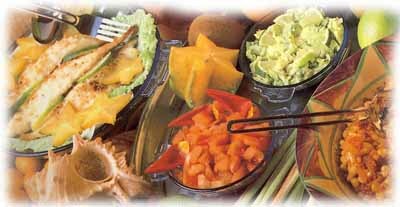 Try to find authentic ingredients at Caribbean grocers when making our Caribbean hors d oeuvres recipes. If you’re not able to, we’ve provided acceptable substitutes, don't let it keep you from cooking Caribbean! Allspice is the dried berry of a tree that is indigenous to Jamaica and has the flavors of cinnamon, cloves and nutmeg. Annatto: Very common spice used in all of the Spanish Caribbean. Spice adds great flavour and an orange colour – used as a substitute for saffron by the Spanish settlers. Now it is primarily used in paella and rice and peas. Arrowroot: if a Caribbean recipe asks for arrowroot you can easily substitute with corn starch. Avocado: Avocados are commonly used throughout the Caribbean (known in the islands as pears). To prepare an avocado, cut in half and twist the two halves to release from the pit. Remove the pit with a knife and rub exposed flesh with lemon or lime juice to prevent discoloring. Beans: Caribbean recipes tend to use “peas” for both beans and peas. Caribbean rice and peas is a staple in the islands and is made with kidney beans or pidgeon peas. Boniato: A Caribbean sweet potato, slightly less sweet and smoother in texture than their North American cousins. If you can’t find boniatos, substitute with a small sweet potato. Calabaza: A Caribbean squash the size of a basketball with orange pumpkin looking flesh– usually sold in wedges in the islands. Available at Caribbean grocers, use Hubbard or Butternut squash as a decent substitute. Cassava: Known in other parts of the world as Yuca or Manioc. An oblong shaped root with a dark brown bark. Coconut: We all know what coconuts are, but most of us don’t know how to buy them. When buying a coconut, shake it to make sure there’s liquid inside which means it’s fresh. Plantain: Similar to a banana, but much larger and not as sweet. Plantains must be cooked before being eaten.